Friday night of Memorial Day Weekend, the unofficial start of summer, and Joe and Carol B, Jerry and Sue C. joined my wife, Kathy, and myself for dinner at Tre Famiglia in Haddonfield, NJ. Located on Haddon Ave. just a few short miles outside of Collingswood, it’s an area where parking is a lot easier than in the highly visited BYOB capital of Collingswood, NJ. After a couple attempts to fix our wobbly table we were moved to a round table nearby. Round tables are so much more conducive to conversation because everyone is in view. We really should request them more often. Our wine was opened as our server, Giulliano, recited the evening specials. Warm bread and some good olive oil for dipping provided a nice beginning as we sipped our wines and perused the menu. 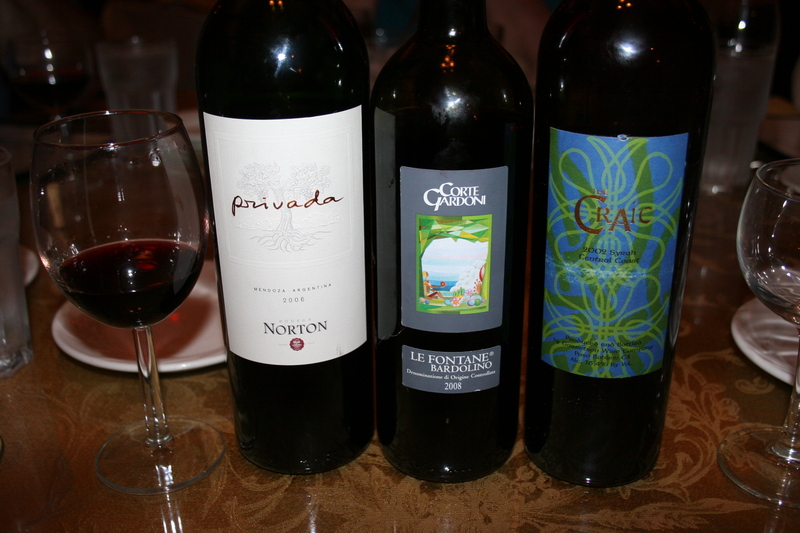 Our wines for the evening were, the 2002 Garretson Vineyards “The Craic”, Syrah, Paso Robles, CA. I dug this one out of my collection. It had been resting for the past few years in my wine reefer and I probably should have removed it a little sooner. A little chill on a red wine can be a good thing but this one bordered on cold, and didn’t really open up until about 30 minutes later. By that time, Kathy had decided that she wasn’t crazy about the wine. I did find it very good with the additional time in the glass was what it needed to reveal the peppery syrah flavors. At 16.4 % alcohol, this one is pretty potent. Joe had brought with him a 2006 Bodega Norton, Privada, a blend of 40% malbec with equal 30% additions of cabernet sauvignon and merlot. It has lots of rich black fruit, well balanced, smooth and flavorful. Totally deserving of the 92 points awarded from Wine Spectator. Jerry had the 2008 Corte Gardoni, Le Fontane, Bardolino. My review of this wine will be proof positive that the only person who can truly decide what you like in a wine is YOU. I can’t tell you, none of the experts can tell you, only YOU know what you like. The best I can say about this wine is that it was “light”. I suppose I could also add, “it won’t kill you”, but there ends all I have to say about it. Here though, is a review by someone else who had this same wine in March at a dinner on St. Patrick’s Day, “Their 2008 Le Fontane Bardolino is damn near perfect. An almost mauve colored wine with red cherry and grapey notes on the nose, it is about as refreshing as a red wine can be. Light in body with a touch of effervescence and lip-smacking, juicy fruit on the palate, it may be the perfect Springtime red.” So, there you are; two polar opposite views of the same wine. It was time to eat and we started with some appetizers. I ordered the Gnocchi Duo. 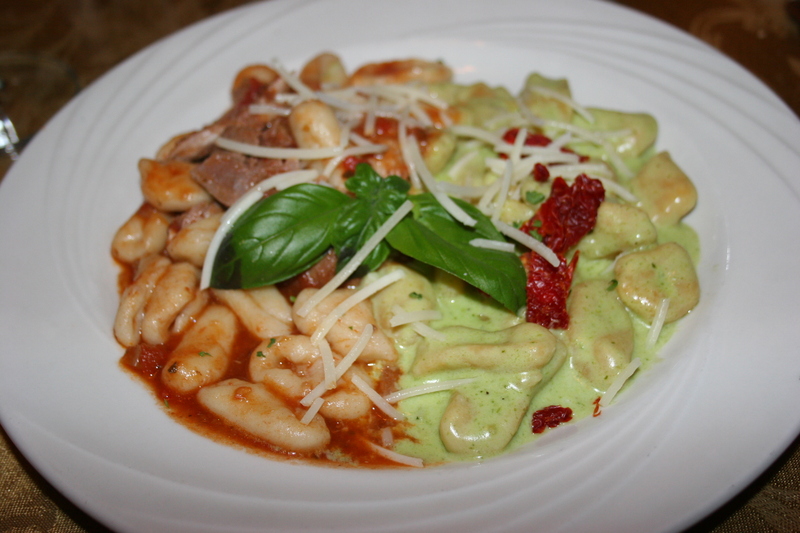 Sweet potato gnocchi tossed in a pesto cream and potato gnocchi tossed with braised pork shank. It was a nice combination of flavors; nicely presented and full of great taste appeal. I was totally happy with my choice of a starter. Carol ordered the Roasted Peppers, freshly roasted red peppers marinated in extra virgin olive oil and basil, with provolone cheese . 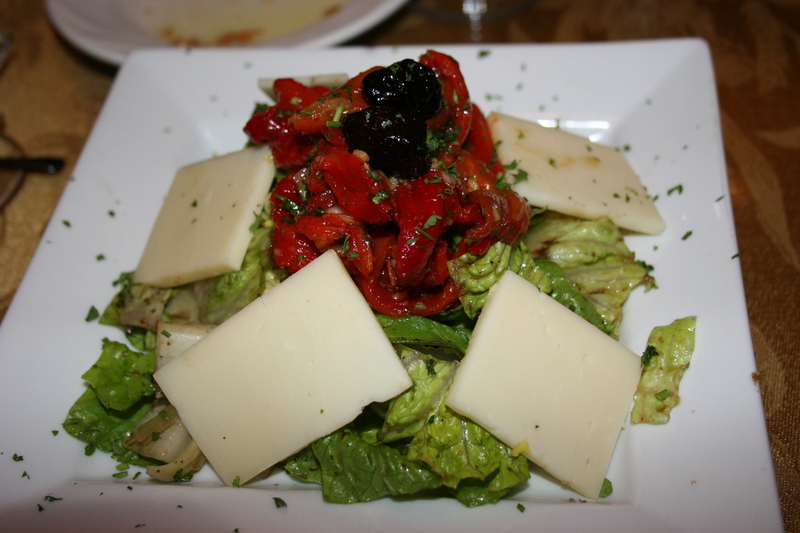 The squares of provolone resting on this salad made it look very appetizing and Carol was happy with her selection. Jerry C., our world-renowned expert on all things bruschetta, chose Bruschetta, Italian bread, lightly toasted with garlic & herbs, topped with finely diced tomatoes and fresh basil. I heard him describing it as having a “nice crunch” with the tangy flavor of the toppings soaking nicely into the bread. The only negative was that a couple of the bread pieces had been over-toasted, which is a nice way of saying they were “burnt”. Joe had no trouble at all finding an appetizer. 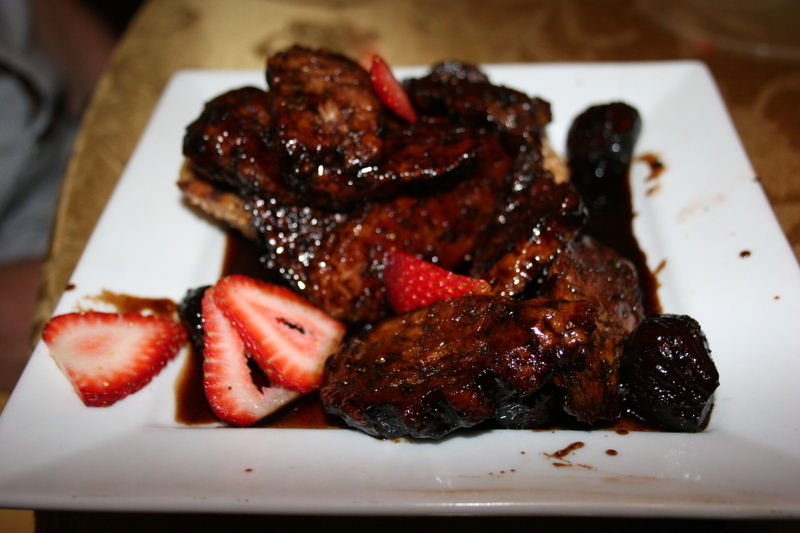 He quickly decided on the Sausage and Figs, house made grilled sweet sausage with figs in a balsamic reduction. He was hoping they would be fresh figs but it appears we were about a week or two too early for them and although he enjoyed his choice, he repeatedly said it would have been twice as good had fresh fig been available. Content with our starters we looked forward to our main dishes. 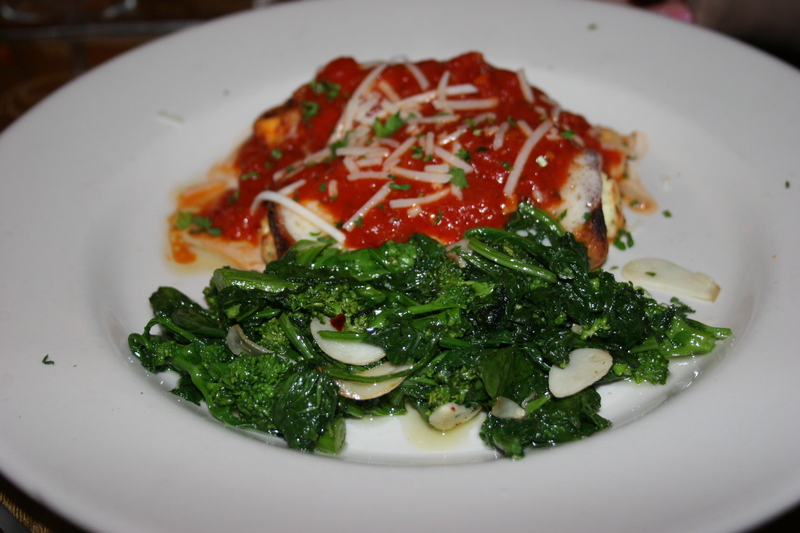 There were quite a few nice specials in addition to an excellent menu and selecting just one item was no easy task. delicate crepes stuffed with ricotta cheese and topped with tomato sauce & mozzarella cheese. She substituted fresh broccoli rabe for pasta and thought the dish was very good. 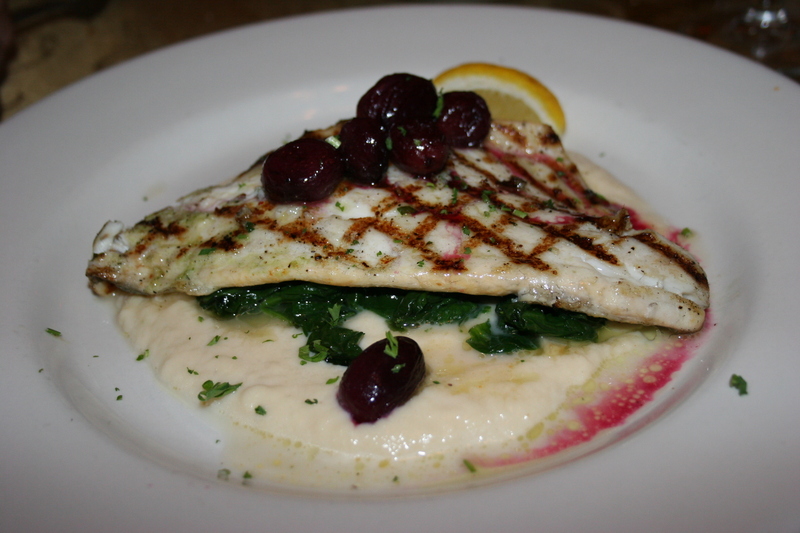 Joe ordered from the specials menu and selected the Grilled Bronzino Filet, puree of white asparagus, sauteed baby spinach, oven roasted red grapes and extra virgin olive oil. The dish was nicely presented and Joe thought it was excellent. Gerry didn’t feel his decision was all that difficult. He also chose from the evening specials and I would have to say that his dish certainly looked the most tempting of all. 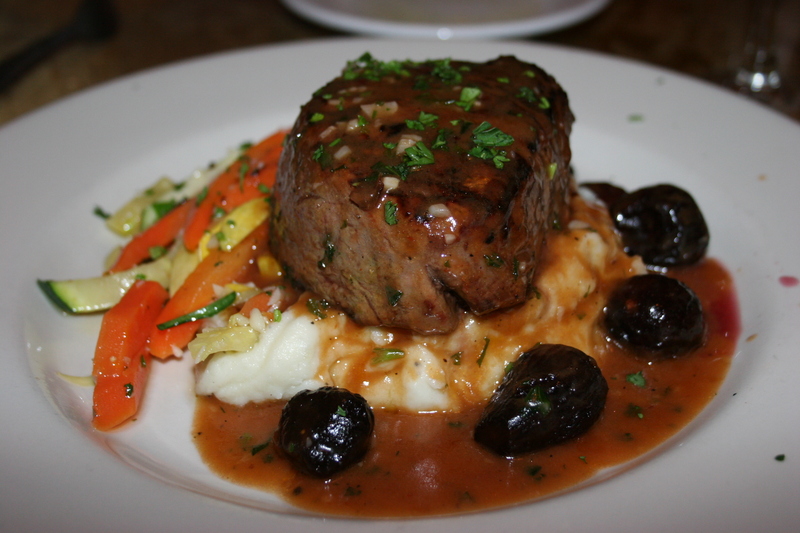 He had the Grilled Filet Mignon, black mission-fig demi glace, sauteed vegetables, black truffled red bliss mashed potatoes. I just took a bite out of the computer screen and I can report that it tasted just as good as it looked. If I sound jealous, I really am not. I was quite plesed with my own choice of entree. I had the Crab Cake Famiglia, house made jumbo lump crab cakes, served over a roasted tomato cream sauce with sweet corn risotto and sauteed baby spinach. This was a great choice. 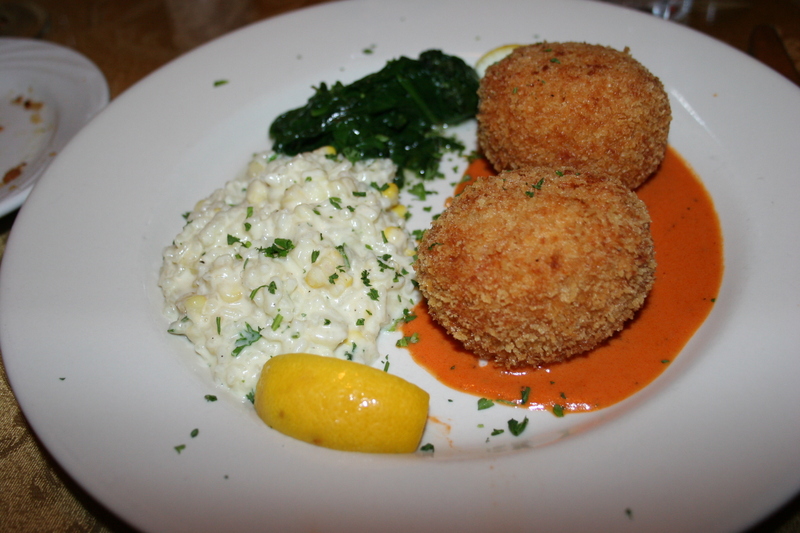 The crab cakes were very well prepared, plump and flavorful with tons of delicious crab, the risotto was scrumptious and the spinach a perfect addition to a great plate. 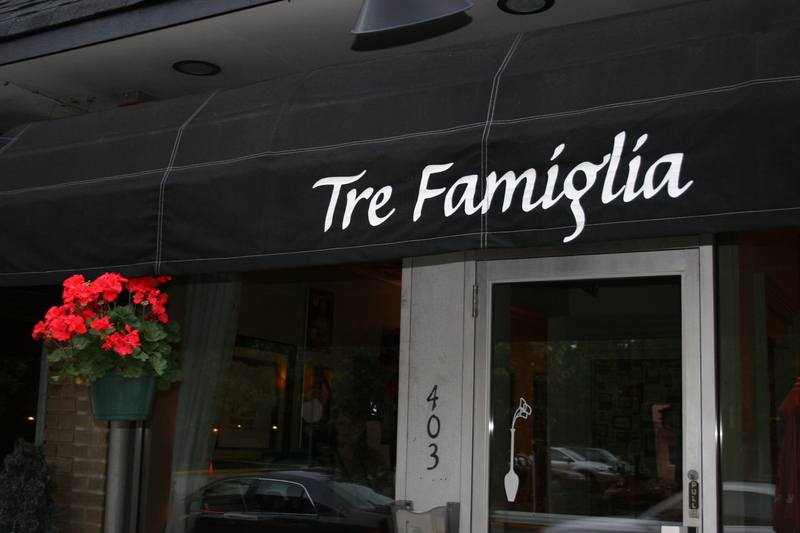 Service at Tre Famiglia was excellent and the restaurant had a nice ambience with good spacing between tables. Most of us had been here before and it’s quite likely we will return again in the not too distant future.